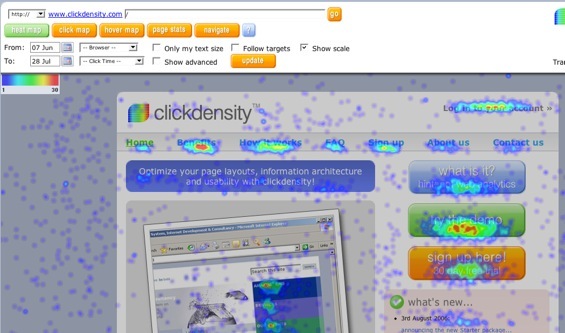 BoxUK’s Clickdensity offers low cost heat maps of web site visitor clicks. We’ve profiled similar offerings from Crazy Egg and Clicktale, but neither of those services are available for public use yet – you can use Clickdensity now. There’s a free 30 day trial for one page on one site and up to 5,000 clicks. Other service levels range from £2.50 (just under $5) up to £200 ($380) per month. To be realistic, there’s probably only so many people who will want the $5 starter kit unless the click quota is raised a bit. It’s a new offering so perhaps they will raise it just a bit. The next service level, 250,000 clicks, is nearly a hundred bucks per month. Relative to more traditional traffic stats services, Clickdensity could use something in between those levels for bloggers with moderate levels of traffic. While Clicktale will offer cool little movies showing actual cursor movement (questionably scalable of course), Crazy Egg may be more affordable than Clickdensity and Google Analytics offers some visualization for free, I’m sure there will be audiences out there that prefer ClickDensity. Heat maps plus time to click are nice and it’s less expensive for small sites than many larger analytics services.